The Ceilidh, a thoroughly Scottish Dance! Not so much Doctor Findlay as Doc Marten - this is robust, uninhibited dancing music, thoroughly Scottish, with a lilt that 'puts the leap on the lame' as they say. 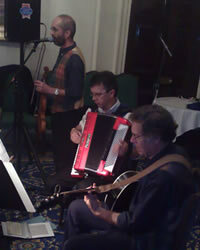 Comprising of an accordion, violin and guitar, our trio has graced every kind of social occasion with traditional ceilidh music for over twenty years. There is a distinction to be made between ceilidh and other forms of traditional Scottish dance. 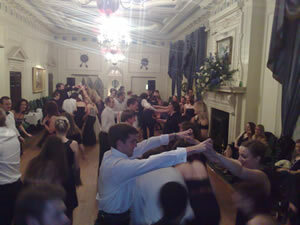 Ceilidh does not require special shoes, kilts or sashes, nor is it overly concerned with finesse. All you need is enthusiasm for a good time. Clear instruction is provided by the fiddler. Organised in sets of two, three, four, six and eight and more, the dances involve a minimum of concentration and a deal of teamwork, which is amply rewarded by a great feeling of participation in attractive dance figures that becomes excitingly familiar. In 90 minutes there could be a variety of six or more traditional dances, each one walked through, then reeled off at speed to exquisite music, accompanied by spontaneous exuberance from the floor. There seems to be almost as much pleasure in learning the dance as in the dance itself. 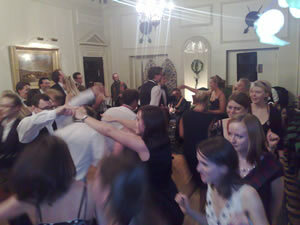 Apart from enjoying the sheer fun and exhilaration of an evening of organised chaos, the dancers leave with the taste of a real Scottish ceilidh, and the fun and pleasure of shared physical and intellectual endeavour. Music: traditional Scottish and Irish jigs, reels and marches. Line up: fiddle (caller) accordion, guitar. An ideal finale to a long working day. An opportunity to relax and unwind. A Ceilidh is not a workshop, more a party. If you would like example pricing for the above, or if you have a similar requirement, please don't hesitate to call us and we'll be more than happy to chat to you... contact us. One final thing... we challenge you to take a photo of a Ceilidh in full swing without having a single person blurred in the picture! We've never managed it! We hope to dance with you very soon.